After a dream debut in I-League, the highest division of league football, Real Kashmir FC’s maiden appearance on home turf on Tuesday united fans from different walks of life as it rekindled the Valley’s love for football. Though the match against Churchill Brothers Sports Club ended goalless, excitement was palpable at the packed TRC Stadium where fans, right from schoolchildren to former Chief Minister Omar Abdullah, came to root for the home side. “The atmosphere was reminiscent of pre-militancy days when even local matches used to draw huge crowds. 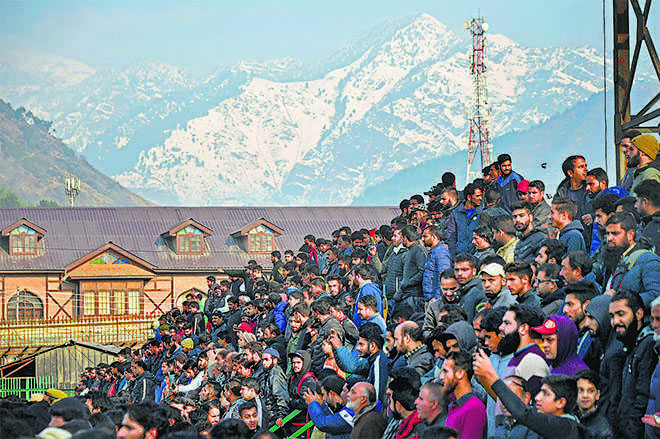 There are not many entertainment avenues available in Kashmir and it is heartening to see people from different age groups cheer for the home side,” said elderly fan Parvez Dar amidst a cacophony of cheers and drum beats. The local team was visibly excited to see the support and promised to perform better in the coming matches. “This is a proud and historic moment for us… we will not disappoint next time,” said footballer Danish Farooq. He said the dream run of Real Kashmir would motivate the Valley youth to take up football. Omar Abdullah tweeted regular updates as he watched the first half. Real Kashmir FC debuted last week in I-League where it stunned defending champions Minerva Punjab FC by a solitary goal. Today’s match was the first-ever I-League match played in the Valley.